Reducing energy cost and carbon emissions is a key ambition of the environmental strategy at Henley Business School, where a rich and varied estate presents a significant challenge in this regard. 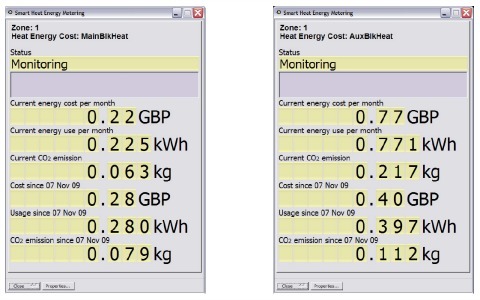 Henley sought to investigate the use of modern technology to better manage energy demand and initiated a pilot project in their student accommodation to draw practical and applicable conclusions. For the period of sampling, the energy consumed in the controlled block is 0.28 kWh in the uncontrolled block 0.397 kWh, a difference of 41%. The cost per KWh is an arbitrary figure at this stage. 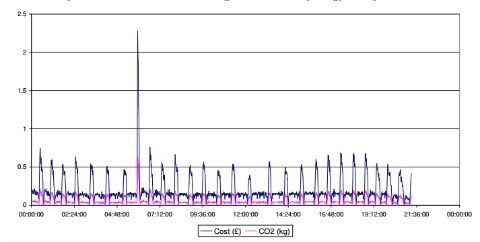 In comparison, the controlled block for that day uses far less energy (peaks at 0.5 not 1.0-2.0) with lower Co2 emissions and cost. Closed-loop logic maintains a more stable temperature environment through the day. 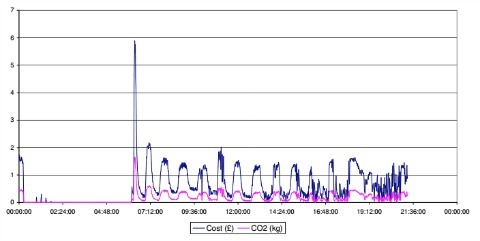 In the above graph of daily energy use and Co2 emission from the controlled block, Hansett detected the inconsistent behaviour of the heating system- one block was on at night the other wasn’t. This behaviour had remained unobserved for a significant period because the existing system could not deliver this data. Accurate diagnosis is a vital stage in the provision of solutions for efficiency improvements. There is no point in fixing the wrong problem. The control and AM&T functionality of Hansett BMS software using Modbus compliant sensors and actuators. The seamless integration of data from the controls system and the business systems of the business school. That Hansett BMS can be installed and supported by IT Engineers without specialist controls expertise and used by non-technical operators.